Marianne Courtenay is an Australian artist best known as a printmaker specialising in limited edition collagraph prints, woodblocks and digital pigment prints. More recently Marianne has been making sculptural and mixed media pieces which often incorporate print components. Marianne has taken part in solo and group exhibitions nationally and internationally for over 30 years. Her artwork is represented in the print collection of the National Gallery of Australia and in the National Museum of Wales as well as in other Australian public and corporate collections and in private collections across Australia, UK, United States, Japan and Europe. Marianne has worked in a variety of tertiary and further education institutions, and in arts and education policy and administration. She limits her teaching now to a small number of workshops at her studio and elsewhere in association with different arts organisations. 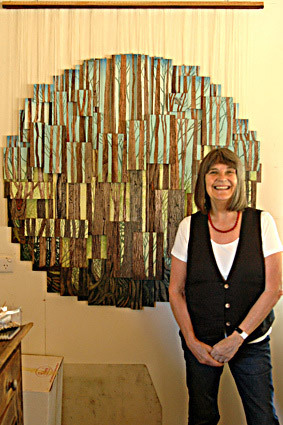 After many years living in the bush Marianne has recently moved and re-established her studio and workshop in Braidwood, between Canberra and the south coast of NSW.